It may not officially be summer, yet, but the warmer temperatures make it the perfect time to head to the beach. Since we live in a state surrounded by the five Great Lakes, there is no shortage of places we can escape to and enjoy the water. However, if we don’t take the proper precautions and think about safety, trouble could be inevitable. The second weekend of June, with five deaths reported on our lakes, is a reminder that we need to stay vigilant and be prepared for the unexpected. 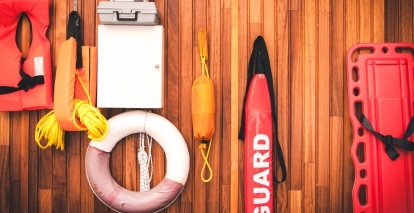 Here are five things you can do to stay safe in the water this summer. Do a little research before you go – Visit this website, http://www.weather.gov/greatlakes/beachhazards, to find out what the conditions are at the beach you plan to visit. If there is a warning to stay out of the water, plan to go for a hike or play in the sand instead. Check warning flags – Once you arrive at the beach, make sure you are aware of the current water conditions by checking the flags. Red means stop – stay out of the water and on the beach. Yellow means caution – watch for dangerous currents and high waves. Green means go – water is good for swimming, but constantly stay aware of changing conditions. Use the buddy system, or lifeguards – Never go in the water alone, or without someone watching out for you. You could be a very experienced swimmer, but unexpected things could happen. Better to be safe, and make sure you have a buddy to keep an eye on you. If you do go alone, go somewhere that has a lifeguard on duty. Always use life jackets – If you’re out on the boat, make sure there are life jackets for everyone. Ideally, you should be wearing your life jacket when out on the water, no matter how experienced you are at swimming. Make sure children are using life jackets, not just water wings, inner tubes or other water toys. Be educated – Take swimming lessons to make sure you feel comfortable in the water, and so you can help others if a situation arises. If you are operating a boat, make sure to take a boating safety class or learn about boating safety. Obviously, the more educated you are about water safety, the better. According to the Great Lakes Surf Rescue Project (http://www.glsrp.org/statistics/), Lake Michigan has had about 220 drownings since 2010. Lake Erie, Lake Huron, Lake Ontario and Lake Superior combined for about 250 drownings during the same time period. So, while we are blessed with thousands of lakes and rivers to enjoy, we need to make water safety a priority.